Bubble-wrapped well and arrived in seemingly perfect condition... 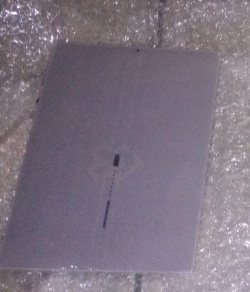 HOWEVER, for some strange reason when I unsealed my Cherry Bullet single album, there were these sticky glue residue all over the front cover. I've never encountered anything like it. It felt like I had unsealed a used album instead. Fortunately, I was able to wipe off the sticky glue/residue with palm oil wipes. Not sure who to blame for this manufacturing error... Today Art? I still was able to enjoy the album after cleaning it. The girls all look so lovely and adorable and I especially like their pink/purple/Loading photos. I also got Haeyoon's pink (Loading) photocard with this single album. 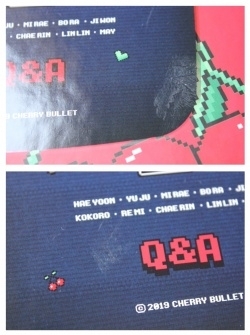 Very happy that she was able to debut in the end and Q&A is a very catchy debut song. Can't wait to see what Cherry Bullet has in store for us next time! Bubble-wrapped well and arrived in perfect condition. They did not come with posters since I purchased them after the pre-order period. 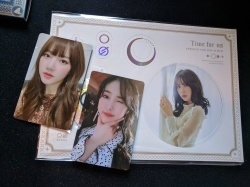 Purchased two copies and they both had (different) Yerin and SinB photocards. One of the wind-chime/dreamcatcher thing I received with the other copy but is not pictured was Yuju. Sadly none of the copies came with the rare Polaroid but it was a really pretty album and I preferred it over the regular Time For Us slipcase albums.